While they keep many point solutions from the SEO industry, including AWR, SEM Rush, keyword.io, etc., in their toolbox, Nick and Antonio showed how Power Digital uses seoClarity’s platform features, like Competitor Keywords, Content Ideas, and Clarity Audit to maximize their efforts, see more data, and drive better results. 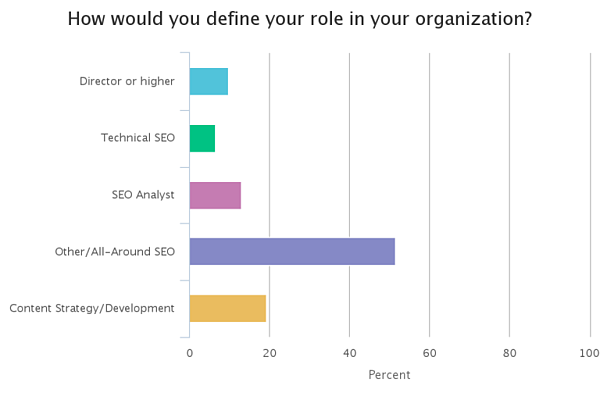 The majority of the audience were All-Around SEOs, whose responsibilities spanned analytics, content, and technical, followed by Content Strategists/Developers and Analysts. 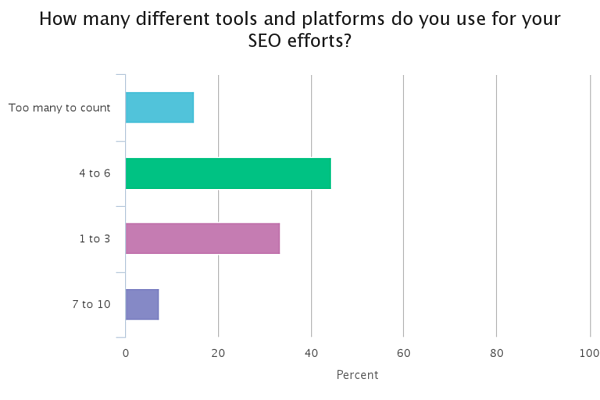 For the question of “How many different tools and platforms do you use for your SEO efforts?”, attendees responded that 51% of them use between 4 and 10 different platforms and point solutions. 15% claim that they use too many too count. With that information, it just made sense to ask “What percentage of your time do you spend each month aggregating data from various point solutions into a single view?” The results were staggering. 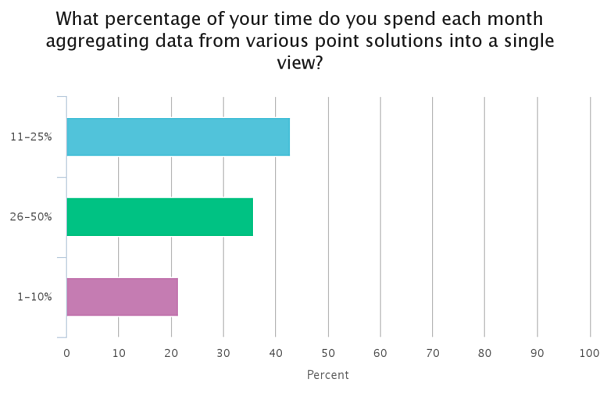 A full 36% of respondents said that they spend between 26% and 50% of their time aggregating their data into a single view. That’s time spent not executing on SEO strategies. Of course, seoClarity can help with that. We aggregate ranking data, crawl data, competitor intel, and link data into a single platform. If you’re spending more time than you care to on reporting tasks and you’re a current client, please reach out to your support representative to ask how seoClarity can help. If you’re not an existing client, please provide us with your contact information below, and we’ll follow up with you for a demo. To see the full webinar and to access the slides, enter your details below!